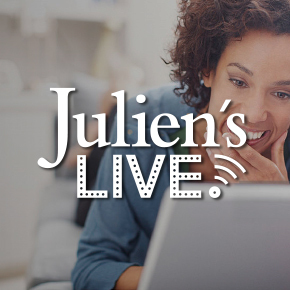 Julien's Auctions' produces museum quality exhibitions in our Beverly Hills gallery as well as other locations around the world. These exhibitions are free to the public, allowing fans and collectors a firsthand viewing of the items prior to the live auctions. Julien's Auctions is proud to present Property From The Estate of Les Paul. Les Paul not only revolutionized the sound of the electric guitar, but also the technology behind modern day sound recording. Julien's Auctions is proud to present the 2012 Hollywood Legends auction to be held on Saturday, March 31 and Sunday, April 1 in Beverly Hills, California. Julien’s Auctions presents Icons and Idols Sports and Rock ‘n Roll to be auctioned on Thursday, December 1st, 2011 through Sunday, December 4th, 2011 in Beverly Hills, California. 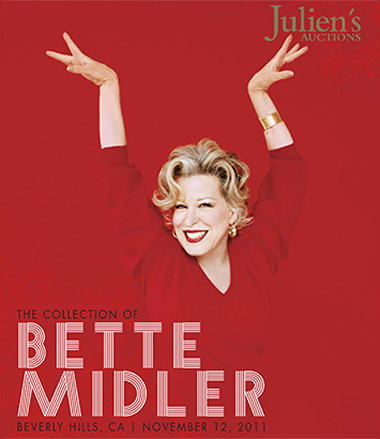 Julien’s Auctions presents The Collection of Bette Midler to be auctioned on Saturday November 12th, 2011 in Beverly Hills, California. Julien’s Auctions presents The Collection of Larry Hagman to be sold on Saturday, June 4th, 2011 in Beverly Hills, California. Julien's Auctions is proud to present "Hollywood Legends" summer auction taking place at Planet Hollywood Resort and Casino Las Vegas on Saturday, June 26th and Sunday, June 27th. In the heart of Beverly Hills, Julien’s Auctions will host an auction of legendary proportions. Julien's Auctions is proud to announce an auction of property from the life and career of Johnny Cash. Julien's Auctions is proud to present an auction of “Icons & Idols” memorabilia and ephemera on December 3rd and 4th, 2010 in Beverly Hills, California. Julien's Auctions is proud to present "Music Icons" summer auction taking place at Planet Hollywood Resort and Casino Las Vegas on Thursday, June 24th and Friday, June 25th, 2010. The Collection of Barbra Streisand will include over 500 unique items from the legendary actress/singer/producer/director's original New York apartment, her Carolwood home in Beverly Hills, and her Malibu Ranch house. King of Pop: A Once in a Lifetime Public Exhibition Featuring Property From the Life and Career of Michael Jackson and Neverland Ranch.